Increasing of material cost is a strong [and obvious] sign of potential illnesses on company’s procurement [and operation in the whole]. Such symptom is ones that a typical controller, armed with an adequate financial reporting system, can spot with a cursory review of the income statement [on the cost of goods sold section]. What to do? This post simply describes forms of financial analysis one should undertake in order to precisely determine the nature of the illness, followed by brief descriptions of possible solutions to be recommended to the management. The largest cost of many companies, especially those in the manufacturing field, is the cost of materials that go into finished goods. Surprisingly, few organizations track the changes in these costs against any kind of standard. Instead, they simply accept supplier costs as a matter of course. On other hand, the material cost used to produce a company’s products is the most difficult one to apply financial analysis to, because materials pass through and are used by many different departments in large quantities. As a result, materials can be lost at many points, which make it difficult to determine exactly how many materials are used by each product. When material costs increase, it may not be because material costs for individual products have gone up at all. Instead, the mix of products sold may have changed, so that a greater proportion of products with a greater amount of material costs in them is being sold. As a result, the material cost on the financial statements is increasing. 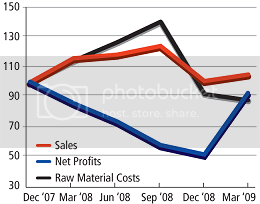 To see if this is the case, construct a detailed cost of goods sold analysis that breaks out the cost of each product sold, using standard costs for the most recent reporting period, and compare it to the same analysis for a prior period. What Should You Recommend To Management? If products with greater material costs are being sold, make sure that those products do not also have correspondingly lower margins. If so, it may be necessary to increase the prices on those products in order to restore overall margin levels. After all, if customers have discovered that a product is priced too low, they may order inordinate amounts of it, resulting in a permanent decline in gross margins. A material price increase may be caused by an increase in material costs on specific raw materials or subassemblies. To test this possibility, compare the standard cost of all purchased items received in the last reporting period to the amount actually paid for them, as noted on either the supplier invoice or the original purchase order. Follow up on all purchase price variances, especially those resulting in large material cost increases, determine the underlying cause for the increase, and take action, either through negotiation with the supplier or sourcing with a new supplier, to bring material costs back down. If the cost increase appears to be permanent, then try to pass the increase through to customers with a price increase. It is exceedingly common for the engineering and purchasing teams that design new products to arrive at a solution that costs more than the originally targeted cost. This variance will not show up on the bill of materials, because the initial cost usually incorporates the actual costs at the time the product was first introduced. Accordingly, there does not appear to be a purchase price variance, just a new product with relatively poor margins. To test this problem, compare the original cost targets for each new product to the first bill of material created at the point of production, and note specific differences in costs between the two documents. Actively review target and actual costs well before a product reaches the market and force the products back into redesign if costs are not in line with expectations. This may mean that some products should not reach the market at all if targeted material costs cannot be reached. The only alternative is to either raise prices on the new product or adopt an aggressive cost reduction plan for the next few years to gradually bring costs down to expected levels (though prices may also drop as competition increases through the time period). A common problem is that the manufacturing process is spinning off an excess amount of scrap, which is contributing to an excessive amount of materials cost. An increased level of scrap cost can be caused by an improperly engineered product that is difficult to manufacture, undertrained production employees, or shoddy supplier parts that are caused by poor supplier qualification or an attempt to shave the cost of purchased parts by buying substandard parts. No matter what the cause, there are several ways to detect scrap. One is to implement a scrap reporting system, which requires the production staff to report on scrap they produce; because this makes them look bad, underreporting of scrap is quite common. Another approach is to tightly control the materials flow from the production floor, so that all outgoing scrap must pass through a control point, where it is counted and its cost determined. Research the underlying reasons for the occurrence of scrap (there may be several), determine which ones cause the largest amounts of scrap, and target those areas for immediate improvement. Sometimes, there is no real material cost increase, but rather an increase in billings from suppliers that is not associated with a corresponding increase in inventory, which results in the false recording of extra expenses. This is a common condition that arises at the end of a reporting period and that is known as “cutoff”. To have a proper cutoff, go to the receiving log and verify that supplier invoices have been received for all items physically received prior to the last few days of the month. Also, verify that there has been a receipt for all invoices booked. By ensuring that both supplier invoices and receipts are posted to the correct period, one can avoid an improper cutoff that will result in the reporting of incorrect material costs. Implement the tightest possible cutoff procedures, verifying that there is a properly recorded supplier invoice in the accounting system that matches a receipt of goods for the same period. This can be done manually, though most high-end enterprise resource planning (ERP) systems contain this feature and will not allow improper cutoffs to occur. Another reason for a material cost increase is that a company has a contract with a supplier that allows the supplier to raise prices from time to time. If so, the proper investigative action is to compare all supplier price changes to the underlying contracts and verify that the price changes are within the proper percentage limits (if any) and at the designated times. If appropriate, management should consider engaging in long-term contracts with relatively fixed prices, if, through experience, management believes that the prices obtained are reasonable and will not be higher than future market rates. Alternatively, if contractual rates are too variable, management can consider avoiding all contracts for some items and instead procure parts on the open market, on the assumption that current pricing is low enough, and that the company will not run short of supplies due to industry under-capacity. Material prices may have increased because the company is no longer buying from its suppliers at volume levels that allow it to be charged discounts. This may be caused by less sales volume or the decision to switch to just-in-time purchasing, whereby individual shipments will be smaller, in order to keep inventory levels down. To see if this is the problem, one can call the supplier to see why they are charging more per unit, compare unit volumes per shipment to contract prices, or run a trend line of total unit volumes per month over a number of months to see if there is a volume decline. Renegotiate prices with suppliers to see if it is still possible to obtain better pricing even though unit volumes have declined. Also, if individual order quantities have declined due to a switch to a just-in-time system, but total volumes are still the same, it may be possible to issue blanket orders to suppliers for a full year of production, thereby allowing for lower pricing while still arranging for a multitude of small order releases against the “blanket purchase order“.